Microsoft (in a write-up Sunday) and Helsinki-based security firm F-Secure say that a new Windows worm is spreading through company networks by exploiting weak passwords. 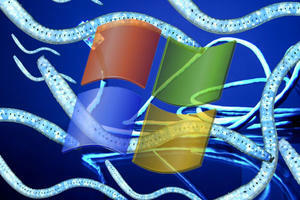 Computerworld reports that the worm, called “Morto,” has been circulating since at least last week, when company administrators noticed systems generating large numbers of unexplained connections to the Internet (see this message on the Microsoft Support Forum). According to Microsoft, Morto is the culprit. “Although the overall numbers of computers reporting detections are low in comparison to more established malware families, the traffic it generates is noticeable,” said Hil Gradascevic, a researcher with the Microsoft Malware Protection Center (MMPC), in a Sunday blog. Computerworld notes that Morto spreads using RDP, or Remote Desktop Protocol, the Microsoft-made protocol for controlling one computer by connecting to it from another. All versions of Windows from XP on include client software that uses RDP to remotely access machines. The software, called Remote Desktop Connection (RDC) in XP, Vista, and Windows 7, requires a username and password to log in to a remote system.